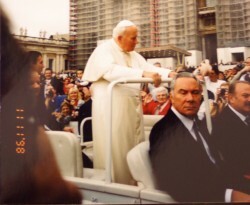 Shortly after becoming Catholic in 1998, I had the opportunity to stand only a few feet away from St. John Paul II at a Wednesday audience in Rome. It was for only a few brief moments, but I’ll never forget the aura of his presence. Despite his obvious frailty, there was something incredibly powerful about this man. He radiated holiness and love. You couldn’t help but be affected. He so moved me that I remained in the open when large storm clouds came rolling in over St. Peter’s Square right before his final blessing. Most fled for the protection of the colonnades as cold raindrops fell like small grenades out of the darkened sky, but I couldn’t leave. I wanted to stand with him. I wanted his blessing. This man loved God, and I knew he loved me, too. And I’m not the only one. The whole world paid attention to the pope because he was real—you couldn’t ignore his authenticity. He practiced what he preached, and preached what he practiced. The twinkle in his eye and fire in his heart drew us to him. We all hung on his words. In his later years he bore his many infirmities with grace and humility, and his ability to inspire us only grew stronger. In fact, if we had been paying more attention, the Holy Father was showing us the true path of the New Evangelization. He was living it for the world to see. It wasn’t just a catch-phrase. No matter the difficulties encountered, he was a witness to hope. He was a witness to love. He was a witness to holiness.